One of the most common questions I get from first time, non-birding visitors to the Baja, is “What is the ominous looking black bird, soaring along the waters edge?”. 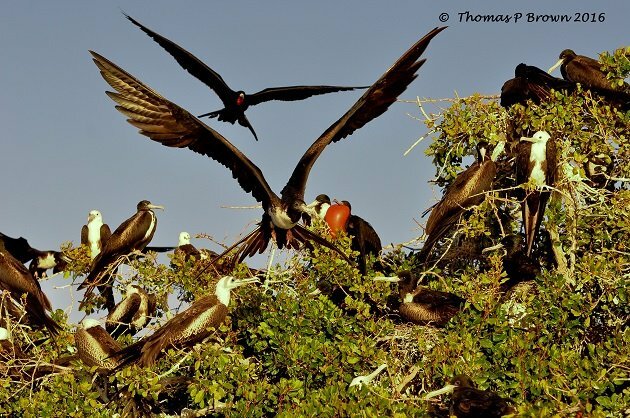 With its large swept back, black wings, deeply forked tail, and long hooked bill, the Magnificent Frigatebird, Fregata magnifciens appears to be quite forbidding. 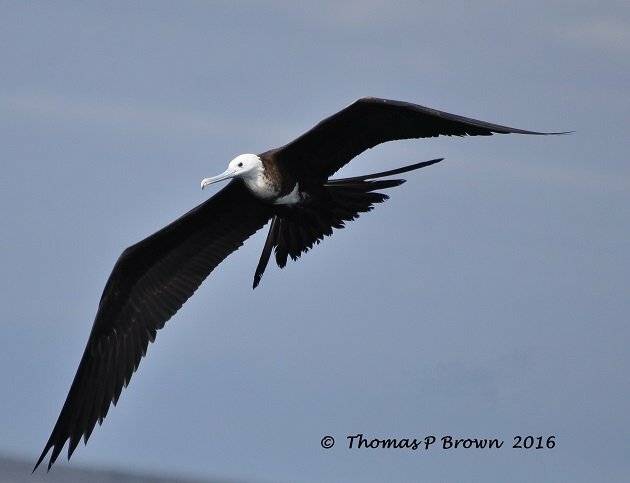 For the most part, this largest of the five frigatebird species actually is, but only to the other costal birds out looking for a meal. 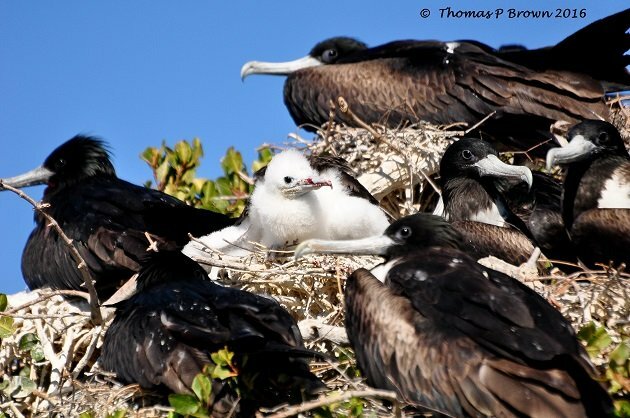 These frigatebirds can get as much as 40% of its food by stealing it from other birds. They are capable of incredible diving speeds, up to 95 MPH/135 KPH. They use this speed to overtake seagulls, terns, and boobies causing them to either drop their catch, or in some cases, regurgitate the meal they are bringing back to the nest. They then catch their new meal in the air, or quickly scoop it off the surface of the water. Besides their piratical nature, they skim the surface of the water and use their strongly hooked bill to grab small fish, squid, baby turtles and in some locations, sea iguanas. They will also fly thru the large breeding areas of many different shorebirds, and pluck an unattended baby right out of the nest. 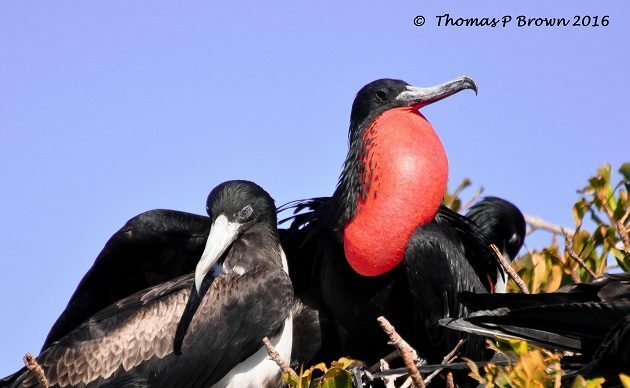 One of the most recognizable features of the frigatebirds would be the bright red gular, or throat pouch that they inflate during breeding in order to attract a female. 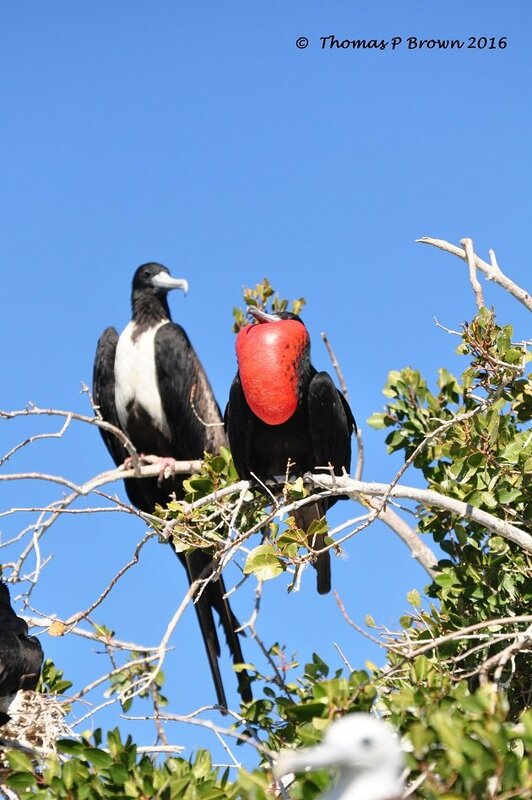 The frigatebird is one of the only seabirds to have considerably different plumages for the male and the female. The males will appear to be solid black, while the females will be black, with a white breast and sides of the neck. The juveniles will have the white breast of the female, in addition to a white head. 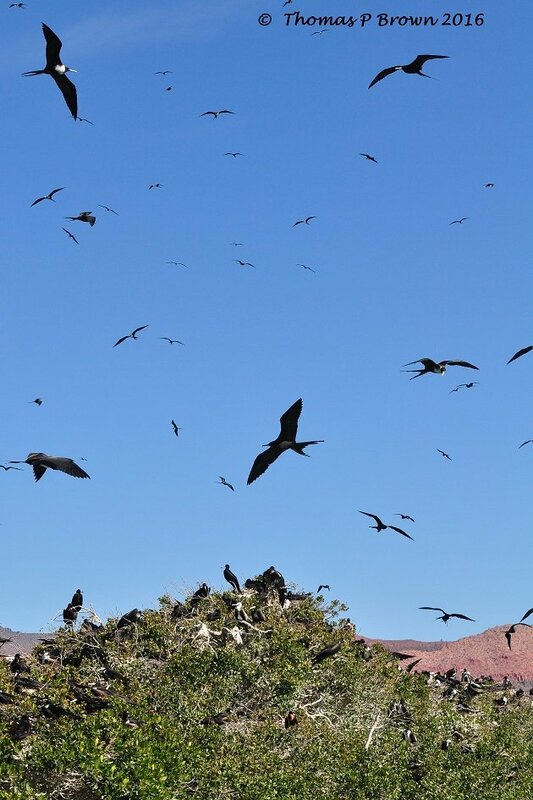 All frigatebirds nest colonially, many in rookeries having 1000 or more pairs all nesting together. Each pair will only lay one egg, and once it is hatched, are some of the most devoted parents in the bird world. The pair will continue to feed the chick for three months, and then the female will take over the feeding duties for an additional eight months. Bahia San Gabriel, on the south end of Espiritu Santos, 20 miles north of La Paz, Mexico has a very large rookery, which is featured in these photos. 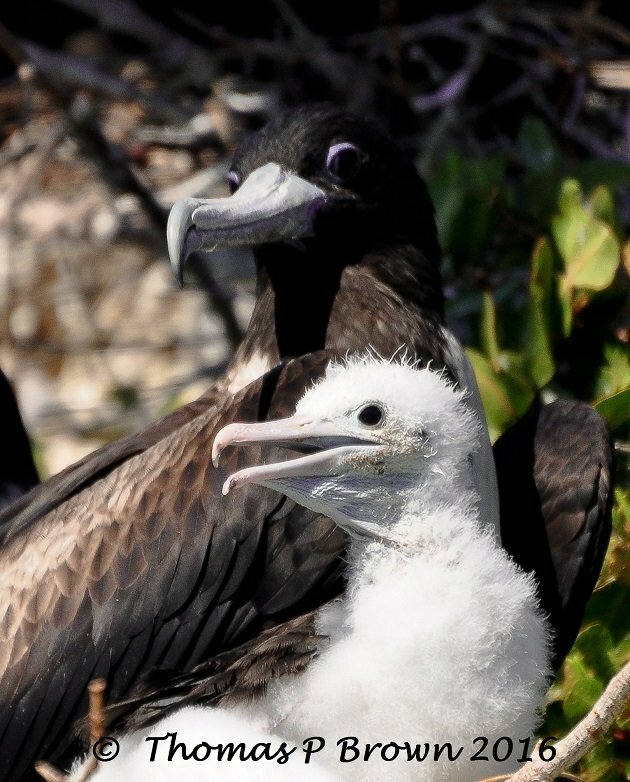 A couple of fun facts about the Magnificent Frigatebirds. With their incredible speed, they are considered the 7th fastest bird in the world. They have the largest wingspan to body weight ratio of all birds. They are one of only a very few birds that are known to soar for hundreds of miles off shore, spending the night in the air. Despite the fact that they spend all of their time over or around water, they can not swim, take off from a flat surface, and are barely able to walk on a flat surface. Should they miscalculate and end up in the water, they will most likely perish. The have little or no oil produced by their uropygial gland, so getting wet would foul their plumage. That added to a wingspan of nearly seven feet, virtually eliminates water take offs. Below is one of several rescues that I have made, all but one of which was a juvenile. This juvenile was retuned to the rookery, and was gone the next morning, so I am hoping for the best! 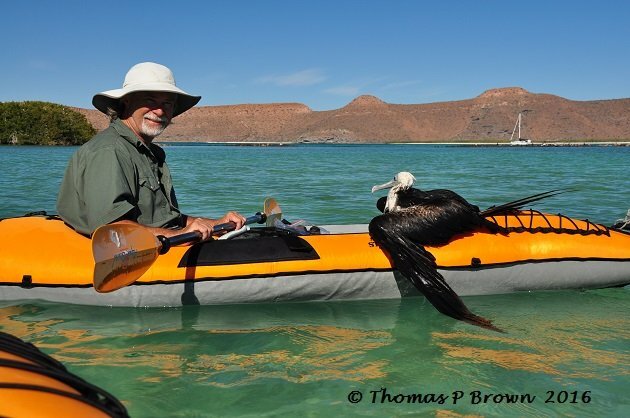 Love frigatebirds. They are fascinating birds to live with. I am from Portland and just returned a few days ago from my first visit to Baja… La Ventana and my first time to become aware of the frigates. Thank you for your information and photographs.